Senior guard Alex Harris muscles through the paint in UCSB's 61-57 victory over Cal State Dominguez Hills in the Gauchos' only exhibition game of the season. Just like a student who sits down for a test and realizes he has all the answers, the UCSB Gauchos were in a giddy mood during their basketball game against visiting Utah Valley State on Friday night. Devine was talking about a sequence in the second half when Utah Valley went into a zone defense, and the Gauchos moved the ball crisply around the perimeter, one-two-three-four-five-six passes, until Devine found Alex Harris wide open in the corner. “I knew it was going in,” Devine said. Harris buried his 3-point shot. The senior guard led UCSB with 25 points. He attempted eight 3-pointers and made six of them. “That is crazy,” forward Ivan Elliott said. For the season, Harris is averaging 23.6 points per game, and he is shooting 50 percent (25-for-50) from long range. “His percentages are ridiculous,” Bob Williams said. But the Gaucho coach said he is not surprised, because Harris is a hard worker who takes extra shots in the gym every day, and in games he patiently waits for his opportunities to strike. “When Al gets in rhythm, he can really stroke it,” Williams said. Harris is not the only marksman on this team. His fellow starters James Powell, Justin Joyner, and Elliott went 5-for-8 from long range. Powell scored 12 points, as did Devine, working down in the paint. Elliott scored 11 points. The 6’8″ senior made his only 3-pointer, and he is above 50 percent (10-for-19) so far this season. Joyner, the sophomore point guard, had seven assists and only one turnover to go with his eight points. Williams pointed out that the Gauchos recorded assists on 20 of their 27 baskets – indicative of an unselfish performance. “That’s a huge stat for a coach,” he said. Nedim Pajevich gave UCSB a solid effort off the bench. The senior from Bosnia, who shaved off his bushy mustache prior to the game, had six rebounds and three assists while making both his shots. “Bring back the mustache,” chanted the student fans in the Thunderdome. But Williams approved of Pajevich’s new look. “He looks so much younger,” said the coach. Utah Valley’s junior guard Ryan Toolson tied Harris for game honors with 25 points. The Wolverines suffered their fourth straight loss and dropped to 3-6 – but prior to Friday night, their worst margin of defeat was 12 points. UCSB (9-1) is on its longest winning streak since the 1988-89 team won 11 in a row. The Gauchos will now take a 12-day break for fall quarter final exams. They will close out the year with three road games: December19 at Ball State, December 22 at top-ranked North Carolina, and December 29 at Eastern Washington. 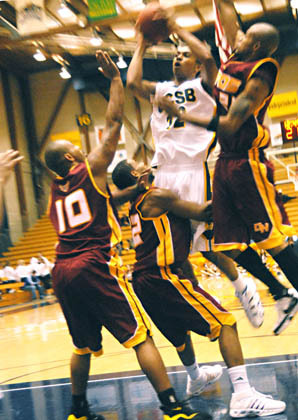 The Gaucho men’s next home game will be their Big West Conference opener, January 3, against Long Beach State.